There are a lot of different definitions of who qualifies as living at the base of the economic pyramid (or “BoP”) in India. We reviewed a number of studies with varying conclusions and have created our own working definition for rural and urban BoP. As context, Unitus Ventures (formerly Unitus Seed Fund) invests with a Profits and Values approach in startups that primarily serve BoP populations. So, as we review a seed investing opportunity, we look at the target customer base for the business. 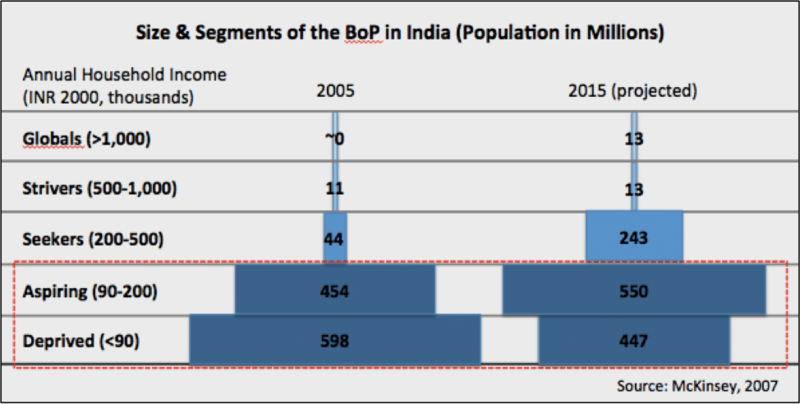 2) In urban India, where cost of living is higher, we consider BoP to have an annual household income of less than INR 300,000. This is equivalent to less than INR 25,000 monthly household income. 3) In rural India, we consider BoP to have an annual household income of less than INR 160,000. This is equivalent to less than INR 13,333 monthly household income.